Comments: Started out from ADK Loj parking area a little after 1300 on Thurs. 5 Feb 09. We skied with full packs to the Beaver Point Lean-to on the south end of Lake Colden via Avalanche Pass--a challenging task with quite a bit of uphill climb prior to reaching the Pass. We met about 5-7 others on the trail, no one seeming to have attempted any summits that day. We made it to the lean-to around 1645 and dropped our heavy load, unrolling our sleeping bags to get ready for a cold night. The sun went down before we knew it, and with the below Zero temp we scarcely exposed more than a finger outside of our bags before daybreak. 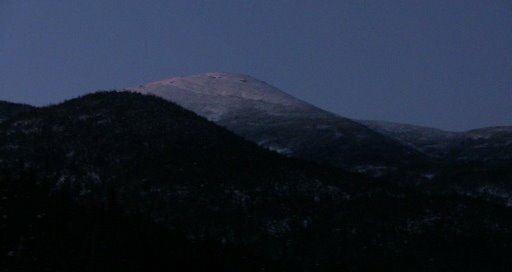 Some interesting nighttime conversation though, and a GORGEOUS moonlight view of Algonquin Peak without even moving from our sleeping places. Friday morning we transitioned from our sleeping bags into our hiking gear w/ daypacks and took off across the Colden Dam for Marcy, this time on snowshoes. It was about 0900 when we left the Beaver Point lean-to and our stuff. The trail heading east from Lake Colden was less crud and more powder than the ski the day before. Close to the Uphill Brook Lean-to we noticed herdpaths toward Cliff Mtn. and Mt. Redfield, although definitely no hikers for a day or two as the trail was filled in with an inch or two of fresh snow. We continued on to Lake Tear of the Clouds and found no herdpath to speak of headed in the direction of Gray Peak's summit. After we hit the trail split with Marcy to the N and Skylight to the S, we found the ascent of Marcy to be relatively moderate in grade, with a trail that had probably been beaten down by a snowshoer just the day before. We threw on our shell layers before cresting the timberline, and trudged up toward Marcy's rocky crown by following the frosted rock cairns. It was a gorgeous day to be atop the #1 highest point in NYS, and we easily spent at least 30 minutes up there. 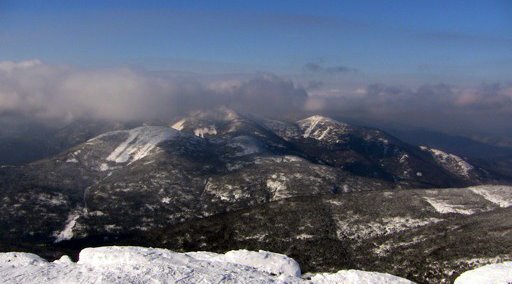 Snow squalls intermittently blew through--covering everything in sight--but then clearing up again to reveal an incredible sun-spotlighted 360 degree panorama of the heart of the High Peaks. Breathtaking, it was the 1st ascent of Marcy for both myself and my climbing partner (Grizzly Adams). We snapped tons of photos (with the battery packs on all but one camera freezing up) and then made our way to Skylight. My partner had to totally re-break the trail over the last 0.2 miles, and then once atop Skylight we gazed upon Marcy and spent nearly another half hour up there. We returned to our Lake Colden Lean-to around 1715 and spent another cold Zero-degree night sheltered in our sleeping bags, occasionally peeking out to look at Algonquin & Iroquois, or around the corner of the lean-to's confines at Mt. Colden. Saturday morning brought about a slow process of emerging from our sleeping bags and packing up our gear. We dismissed the notion of going for another peak, wanted to save our legs for the ski out. Skiing across Lake Colden, we spent several minutes conversing with the DEC Ranger who had stayed at the Interior Outpost for the week, and then skied on out with our full packs. A lot of fun and downhill on the way out, along with some weighty falls (hard to get up after going down with a full pack on) to avoid causing injury by collision to the masses of hikers, snowshoers and skiers making the trek in from the ADK Loj trailhead and mid-point lean-to's/campsites. Reaching the truck at the end of our adventure was a relief, and the Super VanHoevenburgers we wolfed down at Cascade Ski Center afterwards were a true gift of civilization. Special Equipment Required: Sleeping bags with a comfort rating of Zero (or below) !!! I wish I was there. I really miss the mountains after reading this. I have one question did you bring a rock to the top of Skylight? Found a patch kit for the bladder I had to sacrifice, Water will be top priority on the next one, amazing how much energy you lose when dehydrated.